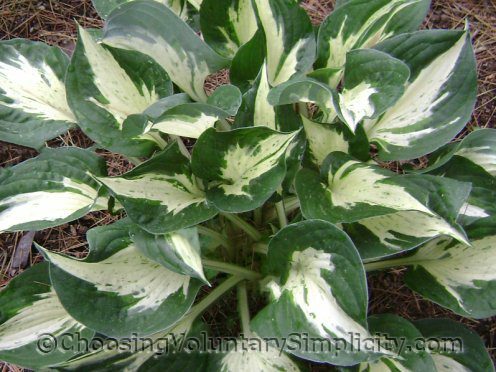 Hosta ‘Revolution’ has a very distinctive color pattern. 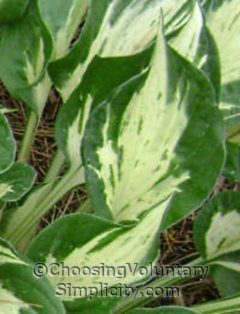 In the spring the centers of the leaves are a light, creamy yellow, speckled and streaked with two different shades of green. The margins are irregular and a very dark green. By late summer the creamy centers have become pure white and the green speckles and streaks have darkened. Hosta ‘Revolution’ is a medium-sized hosta. My mature Revolutions are approximately two feet high and about three feet in diameter. 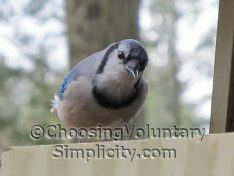 The rounded leaves are heavy and thick with pointed tips. This is one of the later-blooming hostas. It blooms here in late summer and has tubular lavender flowers on 20-inch greenish-white scapes. The seed pods are also an interesting combination of colors… creamy greenish pods with red and dark green stripes. Supposedly Revolution seeds are very likely to produce streaked seedlings, although this has never happened for me. All the seedlings I have grown from Revolution seeds have been a solid very dark green. I want to thank you for all the hosta information you have here. I am just starting to become interested in hostas and I have found your hosta posts very helpful. This has been a troublesome Hosta for me. It keeps reverting back to a solid green and almost every year I have to divide out the green portions. Someone told me that this hosta has a tendency to develop solid dark green sports. The hosta itself is gorgeous though and I am glad to have it. I too haven’t had any luck with getting streaked seedlings from Revolution seeds. It’s good to know it isn’t just me because I keep reading all over the place that it will produce streaked seedlings and mine just hasn’t. Very nice photos BTW.